“How many people live here?,” I ask. That’s China. Here a city that doubles New York’s population is considered quaint. 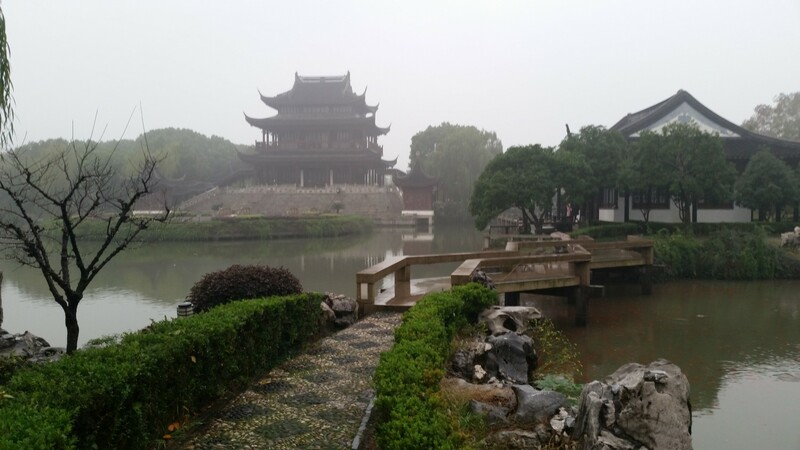 And yet Suzhou, I find, does offer a good daytrip or weekend respite from Shanghai bustle. But I’m here for its historic center, where some of the city’s 2,500-year history still lives in its ongoing shows of kunqu opera or pingtan folk music along with remnants of the Grand Canal, a 1,100-mile cross-country network begun in the 5th century BC. I begin at the Suzhou Museum, opened in 2006, which consciously ties in the past to the present. Built by I.M. 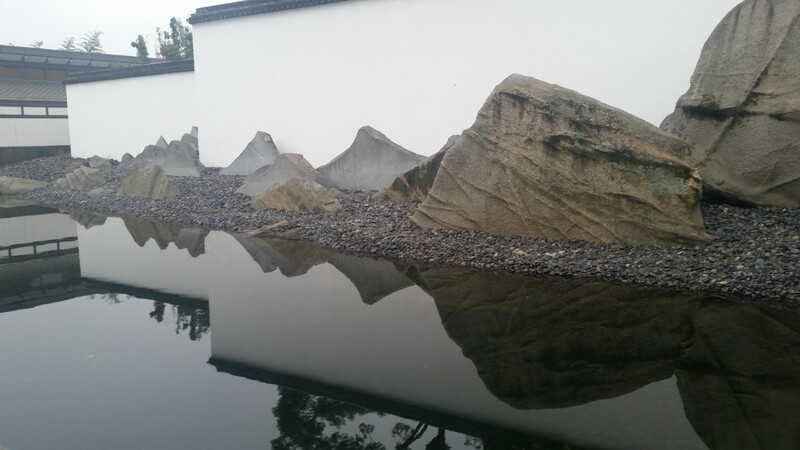 Pei, who was born in Guangzhou, but whose family has been linked with Suzhou for centuries, the free museum is set up with stark white pavilions and a surreal pond backed by mountain sculptures. It’s clearly a modern take on traditional and one Pei hopes can offer an alternative vision for the city’s emerging look. Inside I peek at Neolithic pots, gilded silver or jade figurines, and read about how scholar duties included “imbibing fine waters” and keeping pet crickets. Silk’s here too. Suzhou was once China’s top silk-producing center, and marked – more or less – the start of the Silk Road. Next door is Suzhou’s most famous site, and only one of the many traditional gardens that offer break from city life. It’s only 45 minutes, however, till the Garden of the Humble Administrator closes and the ticket seller is reluctant to sell me one (it’s 70-90 yuan, or $11-14, depending on the time of year). I promise to, but buy one anyway. And immediately see I made the right call. Often crammed by visitors, I’m nearly alone now. I walk on stone walkways, filled with designs of animal depictions. They lead me, in a playful weave, around a sprawling pond that anchors the garden. Rock sculptures make up little islands and dragon-like structures you can walk up. I take a path into a hidden courtyard hemmed in by tiled rooftops that curl up, to the dulling gray sky that casts and eerie light on everything. Hidden speakers begin to play a soft pingtan song. The plucking of a three-stringed lute comes sparse, like the last drops of a rain bending the surface of the pond. I don’t know for sure what the garden is trying to say, but I believe it. It’s raining the next morning. I borrow an oversized umbrella from my hotel and take a taxi to the 14th-century Panmen Gate, a double water/land gate connected to remnants of the city’s ancient wall. I spy on an older man doing tai chi under one pavilion. Afterwards I follow the river, walking over stone arched bridges as tourist boats whizz underneath, then stop when the rain picks up for tea by the Waicheng River. Suzhou was once considered a “Venice of the east” for its canals, and many survive. The most atmospheric is along Pingiang Lu, a mile-long lane filled with medieval homes converted into boutiques, teashops, galleries and restaurants. Occasionally a boat passes, paddle by a woman in a conical hat singing. Most signs on the lane’s shops are in Chinese only, but often no translation is necessary. Chicken feet are chicken feet. Instead I stop for some dumplings in a covered courtyard of an old home that looks like a scene from Raise the Red Lantern, then buy some post cards in a two-floor stationary shop that makes all its own products. I order a tea, then quickly abandon it to explore the old two-floor home. Each nook features a new bizarre wallpaper choice. One says “HARD ROCK” in block letters, another depicts a full wall filled with paperbacks and VHS tapes. Everywhere, importantly, are the cats. 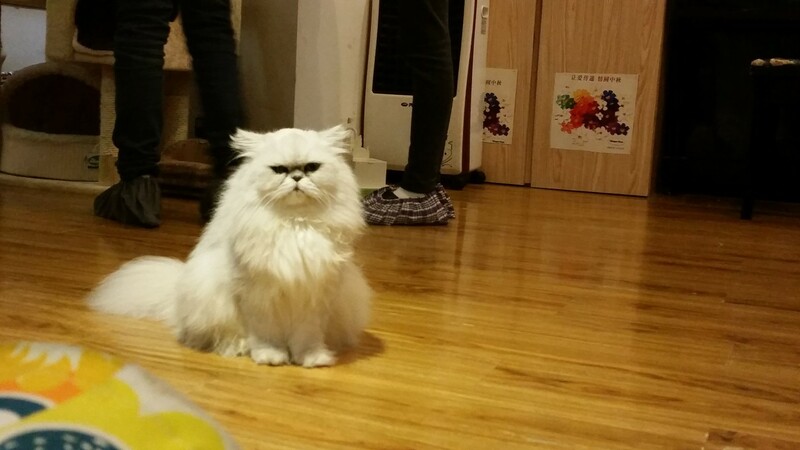 Flat-faced grumpy cats, napping cats in cat towers that reach eight feet high, lazy cats with raccoon-like tails. One plops up on a couple’s table who feed it chicken strips the staff hands out. I hear a rustle below, and a gray one is poking through my bag on the floor. The cat café has 30 cats. And you will enjoy. A side lane leads to the Pingtan Museum dedicated to the traditional storytelling folk songs that began here half a millennium ago. I put on headphones below a display of old LPs. The song playing is built off the skinny-necked lute called a sanxian and sounds like distant kin to bluegrass. And an ebbing, mournful duet comes in. No Chinese is required to realize that not all goes well in this story. I love it. Many restaurants and sites in Suzhou features performances, but this is off season – and I am having trouble catching one. The teahouse I read about is closed for the season (or for good). Off the lane, I spy a CD store and go in to ask about pingtan music. He turns it on. The lute starts popping out its notes, and a mournful female voice bends notes like a lap steel. He nods his head as it plays. Next time, I’ll see a show. For now, I’m happy to have the CD. I recently returned from a trip to Shanghai, Suzhou and Beijing, China, on Hainan Airlines, one of Alaska’s newest Mileage Plan partners. Hainan, a China-based, five-star airline, operates nonstop service from Seattle to Bejing and Shanghai and from San Jose, California to Beijing. Hainan also launched nonstop service from Los Angeles to Changsha, Hunan Province Jan. 21, 2016. All of Hainan’s North American routes are flown by Boeing 787 Dreamliners. Suzhou can be visited on a daytrip from Shanghai, but some events (canal tours and concerts) are best enjoyed at night. Second-class bullet trains between Shanghai and Suzhou cost about $17 one-way, best booked in advance by travel service in advance such as www.china-diy-travel.com. 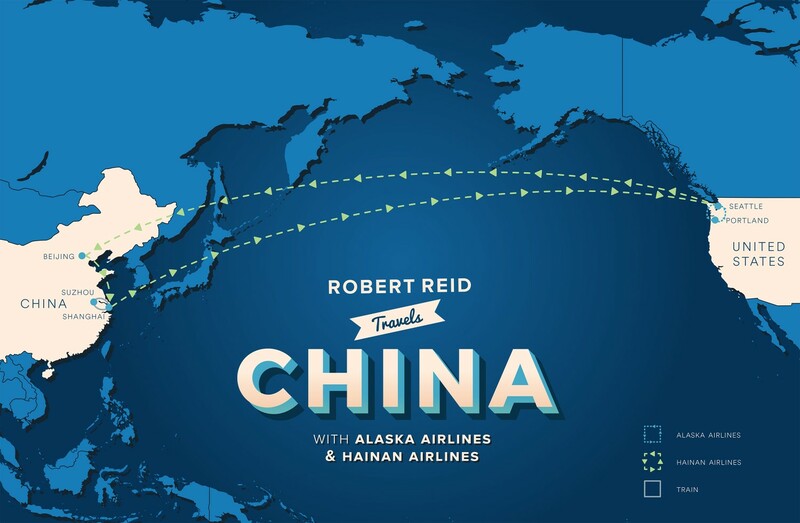 Alaska’s Mileage Plan partner Hainan Airlines operates nonstop service from Seattle to Bejing and Shanghai and from San Jose, California to Beijing. Hainan also launches nonstop service from Los Angeles to Changsha, Hunan Province Jan. 21. I stayed at business hotel Shangri-La Suzhou, a modern tower with a few restaurants and city-wide views. It’s located in the SND (Suzhou New District), a half-hour cab ride from the center.